Given their name, you’d expect all interior barn doors to be rustic looking and confined to, well, barns. 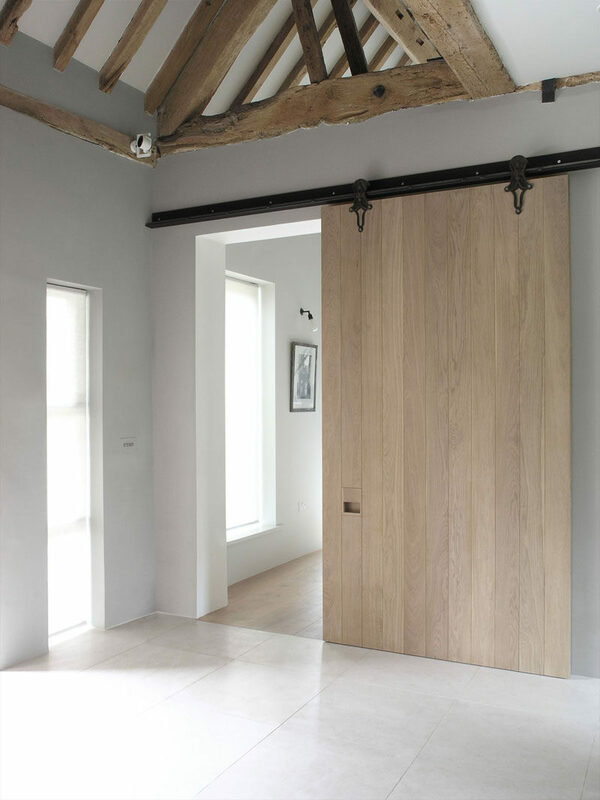 But despite their name, barn doors can add a contemporary look to your interior and make it easier for you to connect the various spaces in your home. They save space by not swinging open and they’re great in settings where you want to conceal things but still be able to access them quickly. 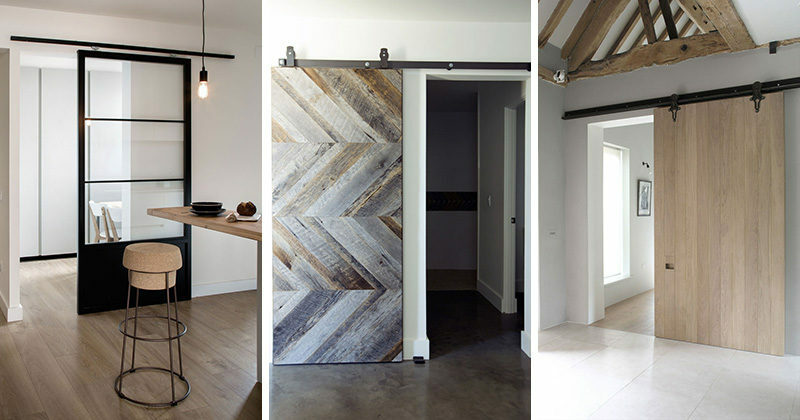 Here are 10 examples of sliding barn doors to further convince you that they can be used in all sorts of settings other than an old barn. 1. 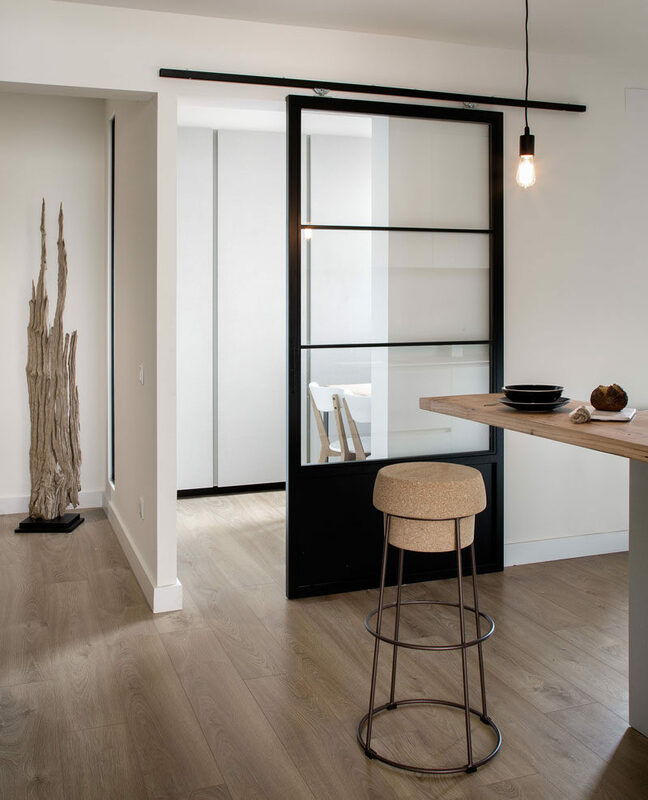 This glass and black sliding door separates the main part of the kitchen from a dining area and gives the space a modern industrial look that’s accentuated by the exposed hanging bulb and metal bar stool. VIVE. designed the interior of this house in Barcelona, Spain. Photography by Marc Ubach. 2. 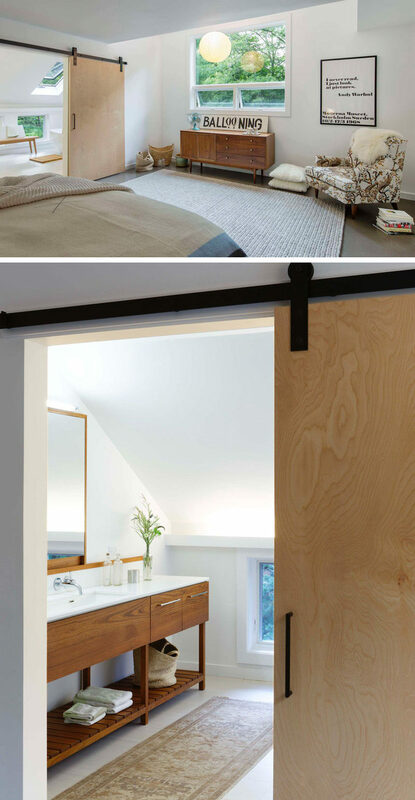 This light wood sliding barn door leads from the bedroom into the bright ensuite bathroom. Aamodt / Plumb Architects designed the renovation of this contemporary home in Lincoln, Massachusetts. Photography by Chuck Choi. 3. 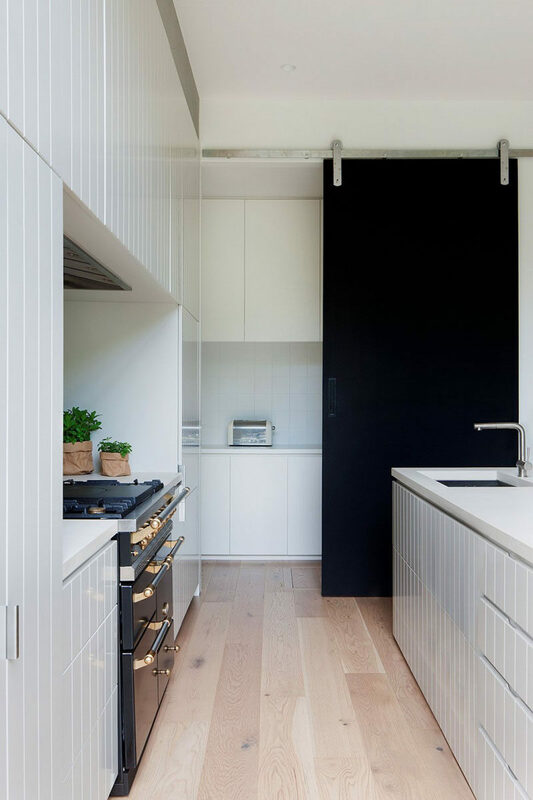 The black sliding barn door in this kitchen creates a bold contrast against the all white cabinetry and light wood flooring. Robson Rak Architects and Made by Cohen designed this modern house in Melbourne, Australia. Photography by Shannon McGrath. 4. Fun, bright yellow sliding barn doors run the length of this small home and conceal the bedroom and the kitchen, as well as adding a pop of color to the simple interior. SHED Architecture & Design turned this barn into a modern house. Photography by Mark Woods. 5. The wood on this sliding door matches the wood used for the beams in the bedroom and creates a look of continuity. Caitlin Stothers designed the interior of this home extension in Montreal, Canada. Photography by Drew Hadley. 6. 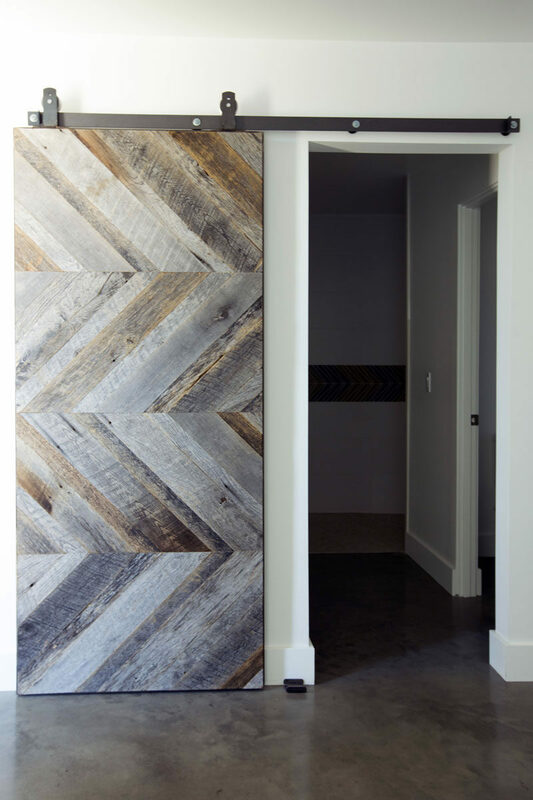 Wood panels arranged in a chevron pattern give this sliding barn door a modern appearance while also maintaining a rustic, industrial look as well. The Ranch Mine designed this home in Phoenix, Arizona. Photography by Jason + Anna Photography. 7. This large sliding barn door made from light wood and a dark metal rail creates a contemporary look in this remodeled home that maintained some of the original ceiling details. McLaren Excell designed this home in Oxfordshire, England. Photography by McLaren Excell. 8. 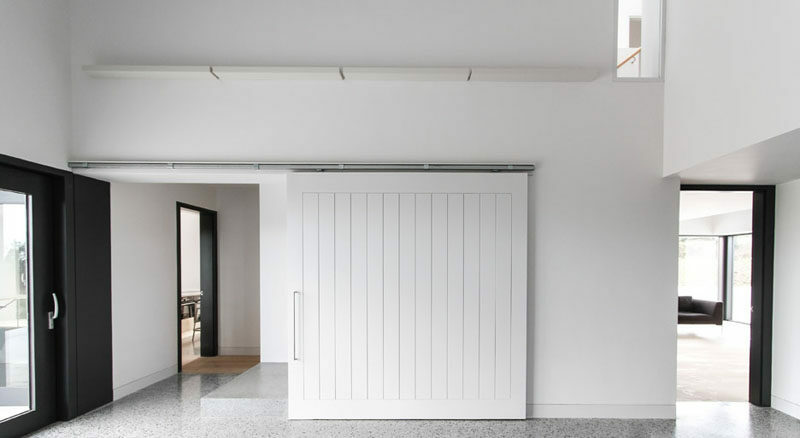 The white sliding barn door in this modern home helps keep the space bright and welcoming, and blends in with the white walls around it. McGonigle McGrath designed this house in Northern Ireland. Photography by Aidan McGrath. 9. 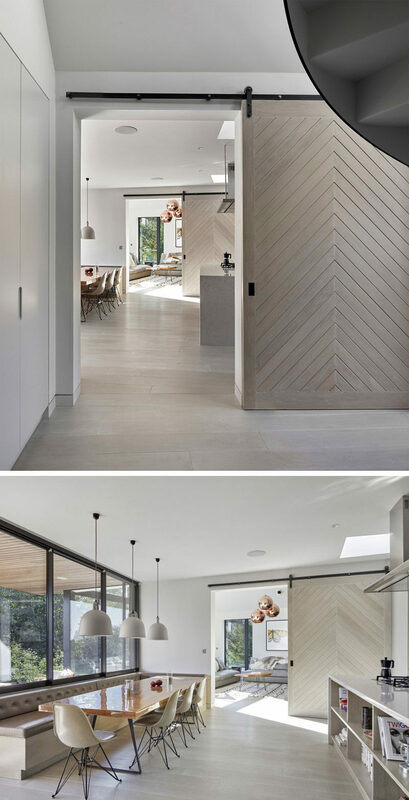 The chevron pattern on these sliding doors give the home a modern look and help divide the space when necessary but also keep the rooms connected. Platform 5 Architects designed this contemporary house in Norfolk, England. Photography by Alan Williams. 10. 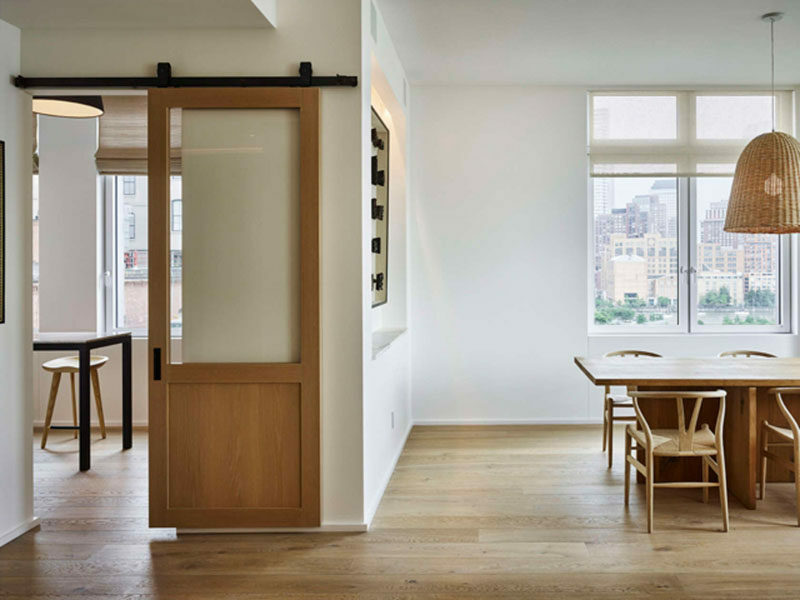 This sliding barn door divides the kitchen and dining area from the living room, and compliments the rest of the interior thanks to the warm tone of the wood. Robert Young Architecture designed this home in New York. Photography by Frank Oudeman.